Only two episodes into the latest and very exciting season of The Ultimate Fighter, it’s the perfect time to take a look back at the top 10 coaches the show has had in its 10 years on TV. Results, results, results. Several of the coaches mentioned on this list had three representatives in the four finalist positions when there were two weight classes, but only Frankie Edgar and Patrick Cote have made the clean sweep. On season 19, Edgar’s red team had Corey Anderson, Eddie Gordon, Dhiego Lima and Matt Van Buren as all four finalists with Team Penn taking the night off. Similarly, Cote’s Canadian squad on TUF Nations had Chad Laprise, Elias Theodorou, Olivier Aubin-Mercier and Sheldon Westcott as the four finalists. How can you question unbridled success like that? “The Answer” and “The Predator” had to be doing something right. Patience. The highest rated season of The Ultimate Fighter was filled with a lot of needed and unneeded drama alike, and one has to give credit to how Rashad Evans handled it all. The TUF 2 heavyweight winner and former UFC light heavyweight champion dealt with a variety of extreme personalities, from his heated exchanges with rival coach Quinton “Rampage” Jackson to Matt Mitrione’s faux injuries of both the physical and mental kind. And Evans never appeared to really lose his top through any of it, all while coaching a team to win 13 of the show’s 15 total fights, including producing the two finalists and the show’s eventual winner, Roy Nelson. With all the weird stuff that happened on the famed 10th season, the craziest is “Big Country” being Evans’ fifth pick and overall the ninth pick, with Rampage passing on Nelson four times. One has to give credit to Evans for, finally, picking the abundantly obvious favorite to win the season. It’s exactly what you would expect from Urijah Faber - a well-run team with a lot of energy, positivity and camaraderie. The dimple-chinned leader of one of the best camps in the world, Team Alpha Male, brought all the tools of the trade that have worked for his crew into the TUF house. From life coaches to Master Thong, Faber turned his blue team into a mini-Team Alpha Male and, in the end, walked out of there with both finalist positions and the TUF winner, Michael Chiesa. Also, it was by far the longest season at 13 weeks because of it being live as opposed to six like every other taped season. Throughout the season, Faber kept up the entertainment too with his back-and-forth verbal sparring with rival Dominick Cruz, and “The California Kid” did win the best coaches’ challenge in the United States Marines’ gun-shooting obstacle course. Already off to a bang up job on the current season, Faber’s Team USA member Ryan Hall won the first matchup on the current TUF season against Conor McGregor’s Team Europe. Much like Urijah Faber, it should not have been a surprise to anyone that Antonio Rodrigo Nogueira would be able to coach fighters to victory, as he has run his own team and been a mentor for fighters for a very long time. Also, like Faber, “Big Nog” was a positive and light-hearted team leader. Basically, Nogueira is one Faber stacked on top of another Faber with a Brazilian accent. On TUF 8, Nogueira’s first light heavyweight pick and his first two lightweight picks all went to the finals, with Ryan Bader winning the 205 crown and Efrain Escudero winning the 155 crown. As a follow-up five years later, Nogueira coached the second season of TUF: Brazil and both finalists were members of his team, with Leonardo Santos taking top honors. Come on, who is more entertaining than Michael Bisping?! When it comes to TUF, nobody is more entertaining than “The Count”. He obliterated the competition to win the third season and would go on to spearhead heated-rivalries on two different seasons, starting with Dan Henderson and ending with Jason “Mayhem” Miller. On TUF: United States vs. United Kingdom, Bisping’s team nabbed three of the four finalist spots and both TUF trophies, and The Count kept the dramatic tension high by having run-ins with not only Henderson, but cast member DaMarques Johnson. On TUF 14, Bisping and Mayhem were at each other’s throats throughout the season and The Count had two finalists and one TUF winner in Diego Brandao. Also, the highlight of that season was Bisping celebrating his coaches’ challenge win by dancing on the air hockey table and promptly slipping and falling on the ground. Without a doubt, the longtime former UFC welterweight champion was absolutely masterful in his cerebral approach toward besting his demonstrative opponent’s team. It all started with the picking the teams and no one did a better job than St-Pierre, as he not only picked the eventual two finalists with his first two picks, but he tricked Josh Koscheck into picking Marc Stevens instead of Michael Johnson, who St-Pierre did pick first. Genius! Plus, GSP brought in the single greatest guest coach of the show’s entire run in famed French kickboxer Jean-Charles Skarbowsky who showed up inebriated and still proceeded to beat the crap out of St-Pierre’s team with perfect technique. Oh yeah, GSP got Mike Tyson to give his team a pep talk too. What else? St-Pierre may or may not have had his team paramedic get in trash-talking sessions with Koscheck. Just amazing stuff from “Rush”. Who would’ve guessed that “The Huntington Beach Bad Boy” would make for such a thoughtful TUF coach? While appearing as a coach on two different seasons, it was the former UFC light heavyweight champion’s first stint on the show as a rival coach against fellow UFC Hall of Famer Ken Shamrock that Ortiz did a 180 degree rehab of his image. Besides not having his trademark peroxide dye job, Ortiz displayed a ton of heart when interacting with his team like an excitable high school wrestling coach, especially with Matt Hamill. Plus, Ortiz’s team took both divisions in the third season with Michael Bisping at light heavyweight and Kendall Grove at middleweight. One knock against Ortiz - on two different seasons he’s gotten smoked in the coaches’ challenges: Shamrock in pool and Chuck Liddell in dodgeball. There wasn’t supposed to be a head coach on the fourth season of TUF, but Matt Serra became it. If you watched one episode or the whole season, Serra’s Long Island accent yelling affirmations and orders from outside the Octagon has been seared into your brain forever. Not only would “The Terror” win TUF 4: The Comeback, but two of his teammates - Patrick Cote and Chris Lytle - who he helped corner made it to the finals as well. The Terror would go on to win the UFC welterweight title in phenomenal fashion against Georges St-Pierre and find himself back to coaching on TUF across from eventual UFC Hall of Famer Matt Hughes. Serra’s official team wasn’t as successful as his unofficial one, but it wasn’t for a lack of trying or yelling. Three years after winning the show in what would become a UFC Hall of Fame-inducted fight, Forrest Griffin did a more than commendable job coaching and an amazing job picking his team. With rival coach Quinton “Rampage” Jackson choosing first, Griffin’s first four picks ended up as three semifinalists, two finalists and Matt “The Immortal” Brown. If “JT Money” Jesse Taylor didn’t go on a “rampage” of his own after the show was over, then Griffin’s team would have had both finalist spots. Nevertheless, Team Griffin’s Amir Sadollah did go on to win the show. One coaching trick of Griffin’s was having his fighter go through his entrance, walking into the Octagon, having his name announced and then shadow boxing the first round as a visual game to get the fighter used to the experience. It seemed to work quite well for his fighters, and other coaches have been shown on the show doing the same thing with their fighters since. To top it all off, in the coaches’ clash, Griffin would challenge and defeat Jackson for the UFC light heavyweight title. An obvious choice to say the least. Between the speeches and the success, Chael Sonnen was a memorable coach in both having character and being a character. Season 17 was an even split of wins for both teams all the way up until the semifinals, where Sonnen’s “Team Darkside” took over and got Uriah Hall and Kelvin Gastelum into that final struggle for the crown. Of course, Sonnen’s gift for gab was prevalent throughout TUF 17 with motivational speech after motivational speech - many directed at the season’s highlight machine, Hall. 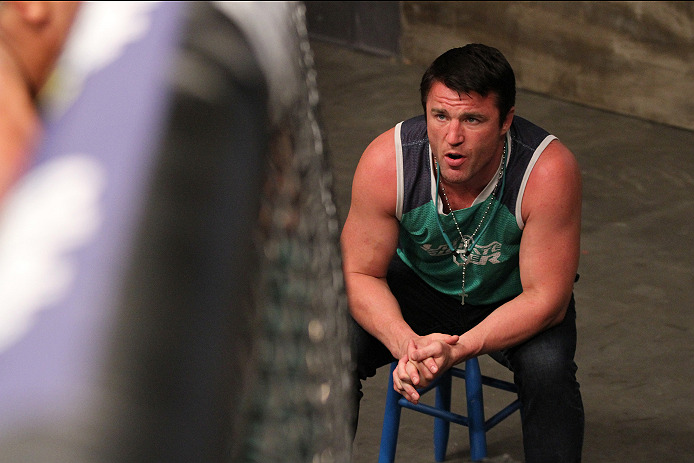 It didn’t stop there, as Sonnen did the unthinkable and very successfully coached on TUF Brazil 3. After spending several years making enemies with that country’s biggest UFC stars and having a language barrier to navigate, Sonnen still coached three fighters to finalist positions and crowned one winner with Warlley Alves.